Giveaway Closed! Winner is Bryan A. Do you have tween or teens in your home? Do you have kids that are headed off to college? Saving space in a child’s room is often one of the biggest complaint when shopping for a dorm room. Even for kids who are still living at home, finding a decent space for anything is tough, especially when you’re dealing with cramped quarters or messy teens rooms! With all the electronics that invade our lives and free spaces in our homes, finding the right item and space is crucial for a successful school year! Check out SOL REPUBLIC‘s headphones and speakers! Do you have a son or daughter that likes to listen to music when they’re studying or doing homework? SOL REPUBLIC has a wide variety of sound-quality products that fits perfectly into your budget and your child’s living space! DECK: A wireless speaker, with unprecedented range and versatility. RELAYS: the active in-ear headphones that keep up with you no matter what the day brings. TRACKS: our signature $99 model that provides superior sound at the price point (on-ear). TRACKS AIR: the first wireless headphones from SOL REPUBLIC, in collaboration with Motorola. COLLEGIATE: our custom collegiate Tracks, we have over 100 universities licensed. Perfect for those students who already have their favorite team (and mega college spirit!) Full list of available teams here! My teen son has taken over the speaker and from where his room is, to where I am in the kitchen and living room, close doors included, I can clearly hear his music playing. You connect the device via Bluetooth or there’s also a connector that let’s you listen to your music though this line. You charge up the speaker with a plugin and when fully charged, you can go anywhere and still enjoy your tunes! Also, there’s an option called HEIST MODE™, which allows as many as FIVE people to pair at once and take turns controlling the music. Pretty neat if you’re good friends with your college roommate! Check out Sol Republic on Twitter, Instagram and Facebook! Although this video doesn’t really give the music quality some justice, my husband and I were outside recently, enjoying the cool air with a little Eric Clapton! You can check out and purchase the SOL REPUBLIC x Motorola – DECK Wireless Speaker at Best Buy or, you can win one here! Where do you plan to listen to your music with this amazing wireless DECK? This Giveaway ends Monday, September 1, 2014 at 12 noon. COLOR IS NOT GUARANTEED! Void where prohibited. (1) winner will be selected using Random (dot) org and notified through email. U.S. residents only. Must be 18 years or older to participate. By entering the giveaway, you give me permission to send your info (if you should win) to the sponsoring company, who will ship the prize to you. Sorry, no refunds or exchanges. Winner has 2 days to respond before I select another winner. Entries/Comments that do not follow the submission guidelines will not be counted. No purchase necessary. This is not a paid post. All thoughts and opinions are my own. I was sent the product mentioned above to facilitate this review. I plan to listen to your music with this amazing wireless DECK speaker at the lake while catching some sun. While I am cleaning the house. Ugh!!! Gets me motivated. Sitting in my back patio. In the heart of our home. La cocina! It is where we share our meals, I cook, wash dishes. Great music and love infused in the food. Love it! i plan on using this at our gym. 🙂 that’s when i love to listen to music the most! My oldest daughter would take it to softball practice. The girls could listen to it to get them pumped up so that they can practice hard. thank you! while working in my garden! I would listen to the Sol Republic deck on my front patio. Sometimes, I like to people watch and relax and it would be nice to put on some tunes. on the beach – I’d make so many friends! I want to listen in the bathtub. On our road trip to Disneyland!! I would use this at the gym! I would use this on the plane! I would use it out back when I am working in my yard. I follow you on FB as Rust Hawk. I follow you on G+ as Rust Hawk. I follow Family is Familia on Google + as rust hawk. I follow Family is Familia on instagram as rusthawk1. If I won these I would listen to them in my yard when I garden or in the tub while I take a relaxing bath. I plan on using the SOL REPUBLIC Motorola DECK Wireless Speaker EVERYWHERE possible! It looks like a GREAT product, easy to use and most important it’s a device I can definitely share with my family. I’m currently subscribe to the blog via email now using my gmail account. 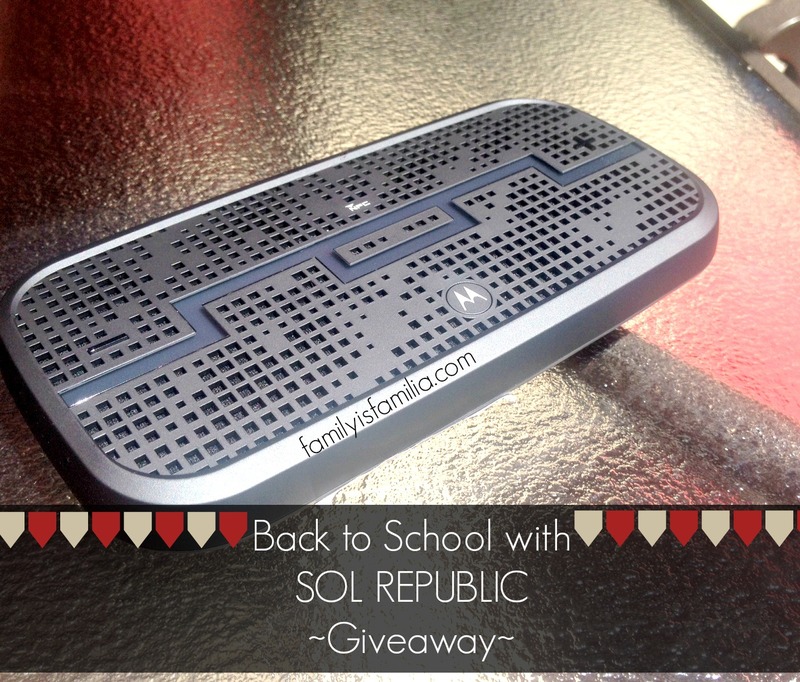 I would use the SOL REPUBLIC Motorola DECK Wireless Speaker every opportunity possible. It would come in handy while BBQing, Camping or just spending time in the backyard with my Family. Oh we would listen to it on walks, at work, at home outside swimming! id use this when i travel with my friends, we always have music going! I’d use it to listen to music in the kitchen and my office while cooking or working! oops 8/25 is the date. I must need more coffee. I plan to take it to the beach with me. Sitting in on my patio. I would use this around our camp fire. I would listen to music in my bedroom with it. I will listen while I clean at home. I would love to listen to it at the park. I would use it outside in the back yard while having cookouts. I’d take these out in my yard! In my livingroom, I am a music lover! i plan on listening to it in my living room while i sew pretty dresses. I would use it at work and home. Take it to the beach too. I’d listen on my patio. I plan on listening to this at the lake while i go fishing. Thanks for the giveaway…our daughters will be listening to music in their bedroom. Follow via Google Plus: Brian E.
Follow Family is Familia on Google + —> Brian E.
I plan on listening to it on my deck. i plan on using this while cleaning the house and cooking.